Get blown away by this modern take on the legendary June-60 chorus in your signal. 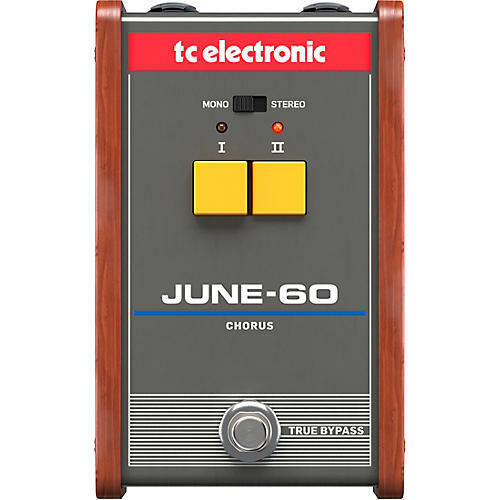 The TC Electronic June-60 is an authentic recreation of the legendary Juno-60 synthesizer chorus with a 2-button interface and Bucket Brigade Delay circuitry. The authentic 2-button interface provides intuitive and fast change of modulation tone. It includes a mono/stereo switch for ultimate chorus experience, as well as true-bypass circuitry for ultimate signal integrity. And the whole thing runs on a 9V battery or optional power supply, and is housed in a “built-like-a-tank” metal chassis.